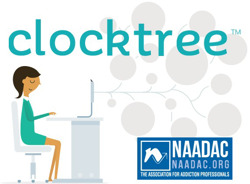 NAADAC has partnered with Clocktree Systems Inc. to provide an affordable, HIPAA compliant telehealth platform to its members. Try Clocktree for up to 10 hours per month for FREE with the Starter Plan! Need more hours? NAADAC members receive a 15% discount off the Professional Plan for the lifetime of their NAADAC membership. Get up to 100 hours per month for only $41.65! Clocktree’s pricing is unique in that monthly prices are per practice for unlimited practitioners and unlimited clients and no long-term contracts are required.